Good luck with your new tractor. I have a hill farm in Dublin, Ireland and am considering a secondhand machione. I have a very large tractor at present but am afraid of the hills as I had one frightening experience already. Really great to see some information on these tractors on the web. Very much looking forward to hearing how you get on as I am think something like this would meet my needs in the Shropshire Hills (40 acres) once I get back from Tokyo. I am considering one of these. Our place is in Italy and is on the steep side. Our neighbours all have a vareity of machines but the conventional ones don’t look at all stable on our land and the tracked ones, though stable, crawl at a snails pace and chew the ground up when turning. I only want a single machine if I can get away with it. I am really interested in your opinions. Looking forward to what you have to say on the subject. iI would be very interested in any further comments on the tractor as this is the sort of thing that myself and my partner Sue are looking at. 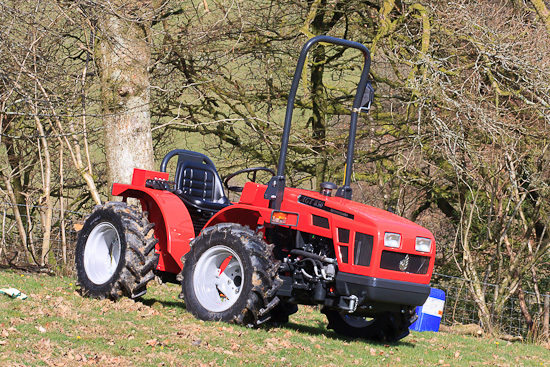 Just purchased a Godoni alpine tractor from CTM in Yorkshire to replace a Zetor 4 wheel drive tractor that was churning up our land due to the wet weather. I am amazed at the Goldoni it will go any where does not sink in and handles slopes with ease great little tractor. Hi Paul, which version of the Goldoni do you have? 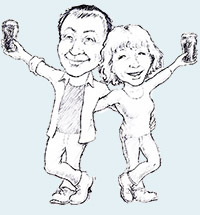 Hi John, thanks for your blog! I saw you wrote this in 2011 I’m considering buying a Agromehanika AGT 850 I have seen one on special sale. It’s with the rotating chair. I have 50 acres of land mainly wood. Now 2 years after your purchase do you still like the tractor or would you buy something else? Is it reliable? Hi Timo (sorry for the delay). So far the tractor has done all I required and I’ve had no problems. So far so good! 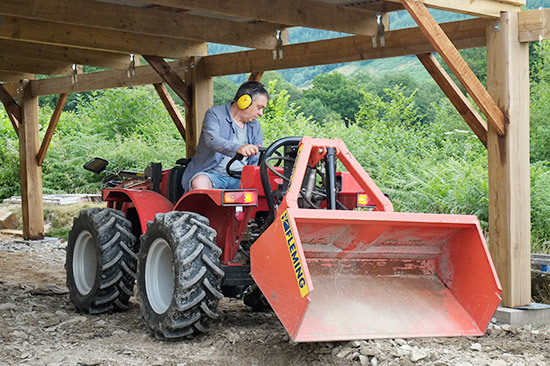 Hi All, Iam on steep hilly property with mixed requirements for tough little tractor. Flail mowing, finish mowing, gradeing 1km steep driveway, forest plantation work, 4in1 loader work and forklift…etc. I need a tough reliable compact hillside tractor thats super reliable & not to expensive. Do you think the Agromehanika 850T / 860 are up for the job ?? Any feedback from those that have used them would be greatly appreciated. Thanks for reading Drew. I’m going to try to get round to writing a more detailed update soon. I’ve had no problems so far until recently when I found I had a cracked exhaust manifold. Nothing serious just needs welding. Tractor starts fine works on my steep hills ok and feels very safe on them. It probably isn’t the best built machine in the world and the engine isn’t the sweetest but so far so good. Whilst it can handle most of the jobs you mention I’m not sure how good it would be with a loader; it might try and bend in the middle (if you see what I mean). I quite often use it with a hydraulic transport box in the reverse driving position for grading and carrying stuff around. Hello John (et al), I have a small avocado farm in Australia, with relatively steep slopes. Whilst the gradient is good for drainage (get good rainfall), it’s challenging for tractor work between the trees, especially if you are not overly experienced! My neighbours have an Antonio Carreras tractor which handles the terrain very well, but comes at the price of a Lamborghini. Given I only weekend farm, my tractor needs are relatively limited to slashing and use with a forklift for lifting and carrying bins. With itinerant workers helping pick the avocados, it’s also important that it’s easy and safe to use. I am looking into the AGT 850 which is smaller than my current Deutz but likely safer on the slopes and more manageable. So to my questions, has Liz used the tractor, or to others have you had less experienced operators on the AGT 850s and how safe have they felt? I would appreciate your thoughts and views. Hi, thanks. Liz hasn’t used the tractor on the slopes. Merely on the lower levels; purely and simply because it’s not really her thing! I was brought up on a farm so have driven tractors all my life. That said it isn’t hard to drive and certainly easier than the tractors (Massey Fergusons from the 1970s) that I grew up with on the family farm. As an update it still has not done big hours (compared to a commercial tractor); probably around 500 hours now. There have been no major mechanical issues so far – just 2 solenoids have failed that control the hydraulics (but I think that these are fitted, depending on specification, locally by the dealer not the manufacturer and the hydraulic oil filter had to be replaced as the power steerng was getting sluggish). It still does what is asked of it on the steepest land and I never feel unsafe on it.